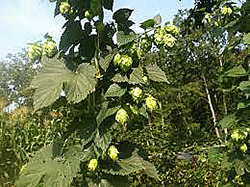 The end of August sees the beginning of hop picking. Certainly not the sight it was when the hop gardens were filled with people rather than machines. Sadly I don’t think there are any hop gardens remaining in our Parish, but we don’t have to travel too far to come across them. Nowadays, there do seem to be fewer gardens and Kent would be a sadder looking place if they disappeared. The availability of the hop bines always produces a moment of madness in our household. Every year we replace the hop bine that hangs over our fireplace. Although not superstitious (touch wood) we keep to the tradition of not allowing the old and the new bine in the house at the same time or allowing their paths to cross. This usually requires me shouting 1, 2, 3, GO, from the back door with the new bine whilst my Official Taster waits ready to take the old one out of the front door. Its tiring hauling the bine up and securing it, but its powers to induce sleep over those first few days when the aroma is strong is welcomed. How sad it is that our local pubs are having to reduce the amount of hop decoration due to insurance companies seeing danger in everything. Or rather seeing danger in them having to pay out. The excuse that lighted candles and hops don’t go together seems a little strange as I am not aware of hop bedecked, candlelit pubs being wiped out in great numbers. But back to the hop pickers. Oast Cakes were a traditional snack eaten with cheese and beer for elevenses or sprinkled with sugar for a mid afternoon snack. The Oast Cakes would be prepared by the women before leaving for the long day of picking. The cakes were then fried in lard on griddles over camp fires and eaten hot. Sift the flour, baking powder and spice into a bowl. Rub in the lard or butter until the mixture resembles breadcrumbs. Add the sugar and currants and mix in the lemon juice and the wine, beer or sherry until the dough is soft but not wet. Roll out thinly on a floured board and cut into 3” (8cm) rounds. Shallow fry in lard or oil on a griddle or frying pan until golden brown on both sides. These really should be eaten immediately to taste them at their best. My Official Taster said that after all the lard he could still detect some blood pumping through his arteries so suggested Oast Cakes served with clotted cream and jam would be nice. I must check his life insurance.